Once you’ve logged in, you can check your library to see what’s in there. If there’s something you want to save, head over to Settings and click Linked Services to see the services you’ve previously connected. If there are any, you should already see your Ultraviolet movies in those libraries, though whether they show up depends on the studio, so it’s best to link to a couple of different sites to ensure your titles end up somewhere once Ultraviolet goes away. 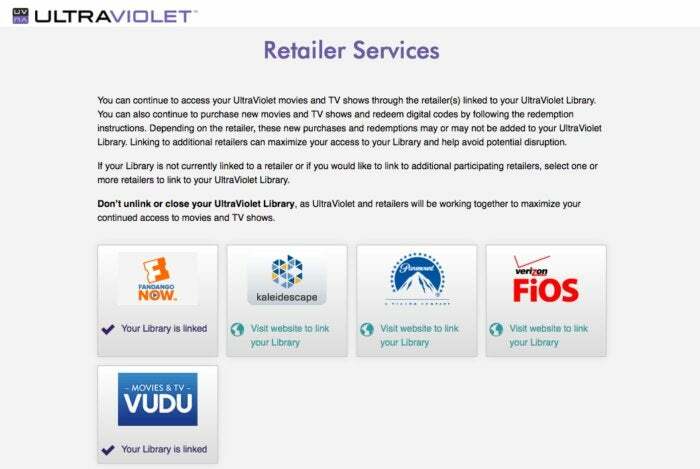 You can link your Ultraviolet movie collection to other services to ensure they don’t disappear forever. To see the available partners, click on Retailer Services. From there, you’ll be able to link your library to an external resource, which will essentially copy your library into their store. There are five services available, but we recommend Vudu above all others. Vudu is Walmart’s service and it includes every major studio, so your entire library will transfer over without a hitch. You’ll need to sign up for a Vudu account if you don’t already have one and then link your Ultraviolet library, but the whole process doesn’t take more than a couple minutes. With your Ultaviolet library linked to Vudu, you can then link your Vudu library to Movies Anywhere so you can merge your iTunes, Google Play, and Amazon libraries into one. Vudu will also link any TV shows in your Ultraviolet library, but they won’t appear in Movies Anywhere, nor will Paramount, MGM, or Lionsgate movies.